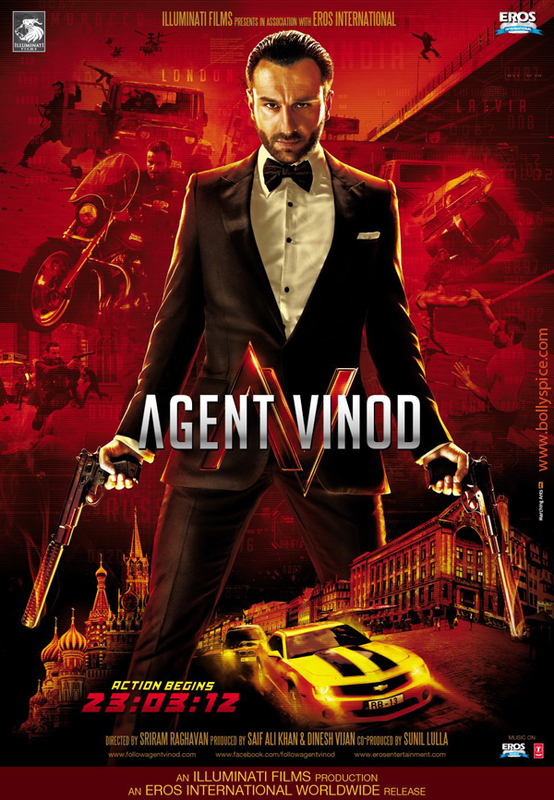 Saif Ali Khan’s home production Agent Vinod has been filming and in post production for what seems like time immemorial, but is now finally heading towards D’Day which is set as March 23rd. Directed by Sriram Raghavan (Johnny Gaddaar and Ek Hasina Thi) and co-staring his lady love Kareena Kapoor, Agent Vinod promises to be an action packed spy thriller. It comes as little surprise that after the huge success of the music of Saif’s maiden production, Love Aaj Kal, that he would rope in Pritam once again to compose for Agent Vinod. Pritam seems to be churning out a lesser number of albums lately but the ones he has composed have gone on to be big chartbusters last year namely Desi Boyz, Mausam, and of course Bodyguard. With two lyricists in hand, Amitabh Bhattacharya and Nilesh Mishra, does this Pritam album have all the makings of another hit album? Well only time will tell, but for now this is what we thought of all the tracks. Pritam kicks off the album with the official remake of the Euro pop number ‘Rasputin’ by Bonny M, titled I’ll Do the Talking Tonight. The original is a pop number fit for its era (released first in 1978) however Pritam has remade the number as a completely technofied version of the original. At first listen the song tends to put you off courtesy of its intro, however enter the female vocals by Aditi Singh Sharma and you definitely warm up to the song. Neeraj and his forced Punjabi is the other aspect of the song that puts you off. This one will be a moot point in the entire album as many will see the beauty in it whilst others may just pass it off as noise. Pritam being Pritam inserts quite an unnecessary remix of the same track. It is purely noise that ruins the beauty of the otherwise rather clever remake of the pop classic. Nandini Shrikar of ‘Bhare Naina’ enters next with the much talked about mujra number Dil Mera Muft Ka. Pritam has gone on record to say that the number is not a classical mujra and it most definitely is not. There’s a bit of rock and metal thrown in to create one hell of an interesting fusion number! The composer has to be commended on being so creative with his lead singer choice because one does envision composers opting for the obvious choice, Shreya, for such a number, but he takes a leap of chance with Shrikar and it pays off well! She’s a refreshing voice that ought to be used more and more. Lyrics by Nilesh are impressive as is the additional vocals by Muazzam Beg, Shadaab Faridi, Altmash Faridi and Shabaab Sabri. It is the blend of the various vocals and of course the blend of genres that makes this track a winner all the way. Definitely one of the highlights of the album. Unfortunetely Pritam did go ahead and ruin a perfectly brilliant number with a remix which is included later in the album. Give the remix a miss and savour the beauty of the original. After the energy packed first two tracks the album comes to a much more mellow number, Raabta (Siyaah Raatein). ‘Raabta’ is the kind of song one expects from Pritam when he sets out to make a romantic number. It’s soulful and minus the unneeded English lyrics it is absolutely flawless. One does miss the innovation the first two tracks encompassed but at the same time ‘Raabta’ is a treat for the Pritam lovers who want to hear him in his element. Joi and Arjit Singh are interesting choices for the track and once again the composer is to be commended for not resorting to obvious choices. Amitabh Bhattacharya pens quite interesting lyrics that avoid the clichéd lines romantic numbers endorse. If you thought the original was not soulful enough for your taste change over to the Night In A Motel version of the same track which has more of an unplugged feel sung by Aditi Singh Sharma and definitely will stir up your romantic side. Definitely the kind of variation of tracks you want in an album with reprised versions because it indeed has something new to offer. There’s also a solo male version with Arijit Singh, which is equally as beautiful and warrants a listen without a doubt! What a refreshing and young voice that is surely to steal hearts with this number. For the traditionalists who perhaps aren’t happy with Pritam’s choice of newer vocals there’s a treat, a Shreya Ghosal version of ‘Raabta’. It definitely does not have the sweetness, freshness and innocence of Joi’s version, however for the die-hard Shreya fans it’ll be plenty perfect! Next up is the comical number Pungi with Mika Singh, Amitabh Bhattacharya and Pritam going crazy at the mic! One listen and you know the lyrics of the track couldn’t have been written by anyone else but Amitabh. This one is perhaps a number to be watched and not listened to as it gets annoying rather quickly, however it will no doubt be entertaining onscreen. Once again there’s an unnecessary remix in the album. If you thought ‘Pungi’ was noise than definitely avoid the remix that is clearly an album-filler number. The last track in the album is a track that is probably going to be heard in the film more than any other, Agent Vinod Theme. Pritam delivers the kind of music that one expects from a spy flick and one can only imagine just how brilliantly it will compliment the stylish action thriller. Here’s hoping the film and its action sequences do justice to this track. ‘Pungi’ definitely stands out like a sore thumb in the list of quite impressive tracks, but is closely followed by ‘I’ll Do The Talking Tonight’, which although is an notable remake, doesn’t live up to the others. Agent Vinod may be an album of reprises and remixes but Pritam for once gets the reprises right because every version of ‘Raabta’ warrants a list. If you’re a serious music lover you’ll appreciate each of the versions as they have their own unique beauty but for others the various reprises of the same track may be just the reason they won’t spend their hard earned money on the album. 16 queries in 0.547 seconds.